Harold Parker State Forest is in Massachusetts north of Boston close to Interstate 93. To get there from Interstate 93, head east on route 125 for about 4 miles. Harold Parker road is on the right just after the State police barracks. This is one of the several entrances to the forest. Harold Parker road leads to the intersection of Jenkins road, then taking a right leads to the Lorraine campground which is open during the summer. (check for dates). Going left leads to the intersection of Middleton Road. Going right on Middleton Road leads to the main headquarters of the park, on the left side of the road. 1933 -1941: CCC constructed ponds, roads, trails, and recreation areas (CCC Civilian Conservation Corps). The campground has 89 spacious sites that are well spaced out. I have camped there several times. The bathrooms and shower area may be old, but everything functions well. The showers are clean and provide adequate hot water. The restrooms are clean. There is a swimming area at Frye pond, which is non-supervised. A section of the shoreline is sandy. This is a popular play area for young children. Near the campground entrance is a small self service free library. The following is a map of the camping area with lot numbers. There are many trails that are good for cross country skiing. The following map is useful as a guide. When the park was first settled it was farmed. Since the soil was not suitable for farming, thus, it was abandoned The area reverted to being a forest. The forest has some stone walls, remaining stone foundations of buildings and a few stone-lined wells are still visible. The ruins of a soapstone quarry as well as a power generation from water are still visible. I have seen horses as well as horse skat on some trails while hiking. Horseback riding on the some trails. Please check for locations. I have seen some sign of bikes riding but have rarely seen any bikes on the trail. I would prefer to bike on trails that are less challenging as these trails. I have not done much mountain biking. I am seldom hiking when mountain bikers are on the trail. The picnicking I have seen is with a blanket and finger food. It was a wonderful place to visit when my children were young. This is a popular fishing area as launching a small boat, canoe, or kayak is easy as several ponds are accessible by motor vehicle. There is an inactive fish hatchery in this area, which may someday become activated. Hunting isn’t allowed on Sunday in all portions of Harold Parker State Forest in the Town of Andover, west of Jenkins Road. Please refer to the Harold Parker Forest website for complete details on all hunting restrictions. The soapstone quarry consists of stone remnants with tool marks scattered over an area. The appearance varies from almost finished to raw material. The forest is hiding the items of interest. Without intervention nature may take over completely. The Jenkins site consists of a pond, dam, stone-lined waterways, stone walls, mill foundation, and an intact wheel pit. There is enough of a drop in elevation to provide power for this sawmill. Starting in 1630 sawmills used a single technology for about 200 hundred years. This consisted of a waterwheel with a crank connected by a “pitman” arm to a wooden frame connected to a straight saw blade. This resulted in the saw blade moving up and down in a vertical motion. Without intervention, nature will take this site over. This site consists of a cellar hole with stone foundation, livestock enclosure, stone walls, a well, and the remains of a kitchen garden. Nature is taking over this site. Only a few things remain at the site of the Robert Mason Homestead, a large field stone, and bronze marker. The plaque is well oxidized but readable. We know it was the home of Robert Mason, a Revolutionary Soldier (1759-1821). Construction of the dynamite storage shed was by the CCC. (Civilian Conservation Corps) A simple shed sits on a poured cement foundation. Corrugated metal covers a wooden frame. Steps lead to an entrance which once had a door, that no longer remains. Metal vent sits on top of a side-gabled roof. The structure has bullet holes, with rust taking over. 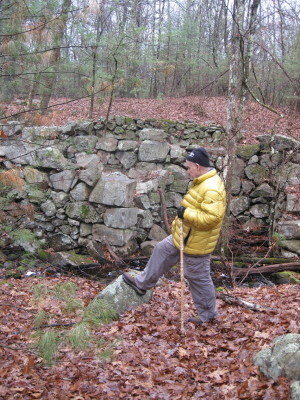 The CCC (Civilian Conservation Corps) built Collins pond and the dam associated with it. The hatchery is most likely a result of the Massachusetts Division of Fish and Wildlife wanting to supply fish for stocking ponds and lakes of Massachusetts. The hatchery is a small concrete building with a wooden roof. All that remains of the roof are the rafters. I visited this place in the late 60’s with my wife and 3 children, but can’t remember if it was a working hatchery at that time. More than 200 species inhabit in this area, including, grouse, woodcock, Great blue herons, swallows, geese, woodpeckers, yellow warblers, rose-breasted grosbeaks, red-shouldered hawk, and owls. This is a partial list of birds in this area. In my opinion, the beaver does more to keep a habitat in healthy condition than any other influence. Beavers build dams which form ponds and wet areas. The wet areas help increase vegetation growth. The growth provides food for many species of wildlife. The dams also trap sediment. The beaver built dams allow some water to pass. Over the years, the beaver population has increased at Harold Parker forest. Along with the dams, they also build beaver lodges for their home. The beaver dams moderate the flow of water, slowing down the flow in the spring when the snows of winter melt and when there are heavy downpours. Without beaver dams, a lot of excess water would soon flow to the ocean instead of being added to the water table. All species of wildlife living in Harold Parker forest benefit by the beaver. In dry periods, the beaver pond seldom dries up completely providing water for wildlife living in the area. Bear, Bradford, Stearns and Sudden ponds have beaver dams. The friends of Harold Parker forest do a wonderful job of providing many extras that make the experience a lot more enjoyable. Anyone who has any interest needs to look at their website. A quick look at this website reveals the many important and fun things this group is doing to enhance the offerings at Harold Parker forest. The site lists a newsletter, a blog, and events calendar. The main feature is the weekly hike on Wednesdays in the forest from 10 am to about noon every week. This is a well-attended hike. I try to go every week. The people are great and the I have hiked with owners and their dogs many times. This group has the best dogs and the most I have seen on all my hikes in over 3 years of hiking. There is nothing like seeing a dog who is enjoying the outdoors and just can’t get enough. The attendance at these hikes varies from 15 to 40. Anyone interested in these hikes should get their name on the email list. See reference link below. The starting point of the hike sometimes changes and on rare occasions when inclement weather necessitates a cancellation. For devoted hikers, this has not happened often. To get on email list for Wednesday morning; 10 am hikes. Follow instructions located on the website listed above.